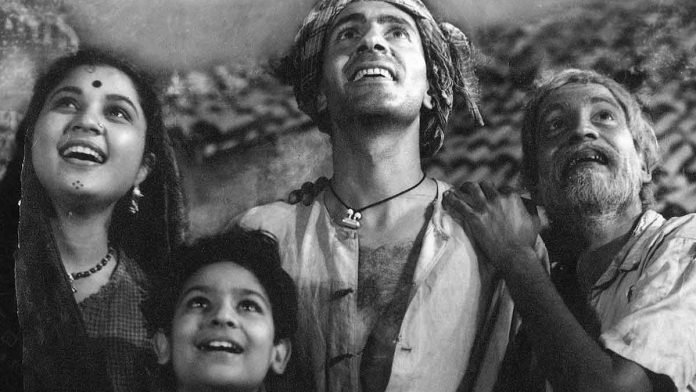 Bimal Roy’s Do Bigha Zamin (1953) opens with a scene featuring farmers looking up anxiously at the sky. As clouds gather, so do the farmers. After two years of drought, their parched farms are finally going to receive rains. Roy’s 53rd death anniversary was observed last week. Inspired by the ground-breaking Italian film Bicycle Thieves(1948), Roy wanted to immediately make something that rang as true as the Vittorio De Sica classic. So keeping in tradition with what later came to be known as the Italian neo-realist movement, he directed a story written by music composer Salil Chowdhury on locations and with (largely) realistic performances. Do Bigha Zamin is about a poor farmer who gets entangled in the web of a zamindar’s debt when he refuses to sell his small land holding. Served with a court order to pay the zamindar Rs 235 in three months, Shambhu (Balraj Sahni) moves to Calcutta (now Kolkata) to earn, despite having a pregnant wife, Paro (Nirupa Roy), an ailing father and a young kid, Kanhaiya (Rattan Kumar), to care for. In Calcutta, he has to deal with the brutality of the big city in an economy that has little to offer for his skills. Having been through a lot of small miseries, Shambhu takes up the job of a rickshaw puller. But destiny has only the worst for him at every turn of his stay in the city. The film’s screenplay was written by Hrishikesh Mukherjee, a long-time Roy associate who later went on to become a master himself. Scene after scene, Roy’s sympathetic portrayal of Shambhu and his family draws you in. Here’s a man who thinks of his land as his mother, so there’s no question of selling it. He thinks of his Thakur zamindar as his ‘mai-baap’ but still stands up to him, in whatever way the feudal system would allow. His honesty and hard work are his only assets in a system that believes in creating debt traps. With a small but devoted family, including Kanhaiya whose character is direct tribute to Bicycle Thieves, Shambhu fights the world that is designed to tear him down. The thing that strikes you the most while watching Do Bigha Zamin is Roy’s near-sadistic and relentless storytelling. In his liberal and intellectual quest to tell this inherently socialism-coloured story, Roy makes it claustrophobic for the viewer, allowing not a ray of light to enter. The work of his cinematographer, Kamal Bose, gives his frames that sense of being airless, especially in the scenes set in Calcutta. “Bimal Roy’s works stand out for their photography. He took great care to reveal the light source and introduced a sense of time. More importantly, it connected one to reality. You could tell what time of the day a situation was taking place,” filmmaker Shyam Benegal said of Roy’s work in Bimal Roy The Man Who Spoke in Pictures, edited by Rinki Roy Bhattacharya and Anwesha Arya. 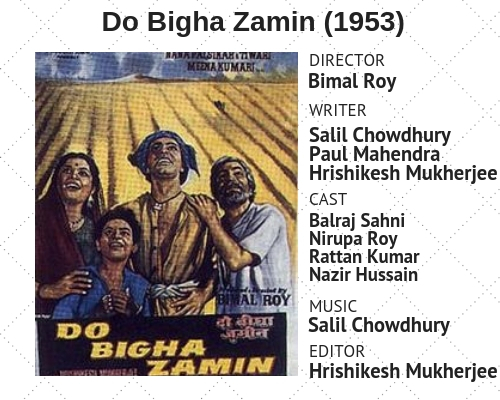 Do Bigha Zamin is also remembered for its harrowing performances. Sahni, till then a suave ‘English gentleman’ took up his most challenging part to turn in an exceptionally layered portrayal. Nirupa Roy and child actor Rattan Kumar too supported him with great turns. Benegal’s words here carry even more weight because he was the true successor of Roy’s depiction of the rural class in Hindi films. In the last two decades, this class has been obliterated from Hindi cinema. That abject lack of depiction is fairly representative of the farmers’ condition in the country today, a lot of which will be discussed as the Lok Sabha elections approach closer—before the subject vanishes again. Roy’s humanism was reflective in not just the Cannes Film Festival-awardee Do Bigha Zamin but his later works too. With the luxury of retrospect, one can ask if the deeply socialist messaging of his films made a difference to his protagonists in the larger state of Indian economy. What one can’t question was his deep commitment to the people he so gently portrayed on film, something ‘Bollywood’ needs to do now more than ever. Poverty doesn’t need glorification. It simply is there , all too pervasively present. In “ first-class” free-market societies there has been an explosion of child poverty and homelessness. In “third-class” socialist countries, it is a long standing preconceived. It has no respect of political ideology at all.